Did the Term “Micro-brewery” Come From Brewing Science? I showed the other day that the term micro-brewery appeared in 1969 in an American newspaper, see this post for details. The term was used by an eminent Belgian brewing scientist, Jean De Clerck. He authored numerous textbooks, was a major influence on modern Trappist brewing via Father Théodore of Chimay, and was long-associated with a famous brewing school in Louvain. Certainly the 1969 usage is not on all fours with the 1980 one, but the main difference is the non-commercial context. The other elements, a very small brewery, one typically making a range of experimental vs. standard recipes, the name itself, and the American appearance, are constant. Not an all fours, maybe on three fours, to coin a term. I added that if one bears in mind the significant influence of brewing scientists on craft brewing, perhaps the term “micro-brewery”, apparently an in-house term before 1970 for an industrial pilot or teaching brewery, was introduced to craft brewing by one or more such experts, many of whom consulted to the nascent industry. Not the least important was Joseph Owades. American-born and holding a doctorate in bio-chemistry he was responsible for a wide range of brewing innovations. They ranged from inventing light beer (the Miller Lite kind) to perfecting the formulations for many early craft beers including Sam Adams Boston Lager, Pete’s Wicked Ale, and New Amsterdam Beer. Due in part to his association with light beer, his star in craft brewing never achieved, in his lifetime, the lustre it deserved. However today, when use of grain adjunct in craft beer is approved by the Brewers Association and we take a wider view of the styles and heritage of all beer, his importance seems greater than ever. In Tom Acitelli’s craft brewing history, The Audacity of Hops, he is referred to as a “quiet and immensely respected force in the nascent craft brewing movement”. He consulted to many early craft breweries including Fritz Maytag’s Anchor Brewing, Pete’s Wicked Ale, Boston Beer Company, New Amsterdam Brewing, and early Ontario microbreweries including IIRC Upper Canada Brewing. His death in 2005 at 86 was widely reported including in the U.K. This Wikipedia entry gives a good overview as does this LA Times obituary. Owades had worked for years at Rheingold in New York, and in the early 1970s with well-known national brewers. He was a member of and received an award of merit from the Master Brewers Association of America. Owades set up a brewing consultancy for small and medium-size breweries in San Francisco in 1975 and moved there three years later from the East Coast. Probably Anchor provided in substance and metaphorically the base from which to develop the practice. The consultancy, the Center for Brewing Studies, thus started before the appearance of the first modern craft brewery, New Albion Brewing in Sonoma, CA in late 1976. New Albion was founded by 27-year-old Jack McAuliffe, a homebrewer and U.S. Navy veteran who had been exposed to good beer during service in the U.K.
After leaving University of California at Davis, home of a noted school for wine and beer studies, U.K.-born Dr. Michael Lewis taught courses on small-scale brewing at New Albion from about its founding. See some bio on him from Brewers Publications, here. Did Owades in lecture notes or some 40 research papers he wrote, or Dr. Lewis in his publications, use the term micro-brewery before 1980? That was the year the term appears in Zymurgy, the magazine of the American Homebrewers Association, as discussed in my earlier post. Does “craft brewing” or a cognate appear in those papers? What did Jean De Clerck do on his U.S. brewery tour in 1970, whom did he meet? Do the terms micro-brewery or craft beer appear in proceedings of the Master Brewers Association of America during the 1970s…? These sources could well supply a link between the intra-mural sense of micro-brewery before 1970 and the modern sense. Or perhaps they would not. My point here is to note the many links between brewing consultants who had worked in industry or teaching and early craft brewing. Speculation on vocabulary transfer, and the impetus to further research, gain credibility in consequence. N.B. See the third part of this study, here. 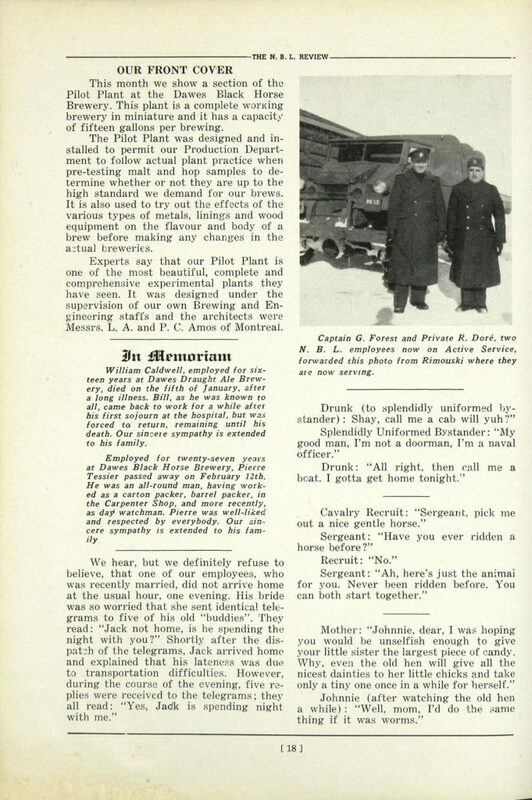 Note re images: Both images are from a 1943 issue of Review, an employees’ (in-house) publication of National Breweries Ltd. in Montreal. 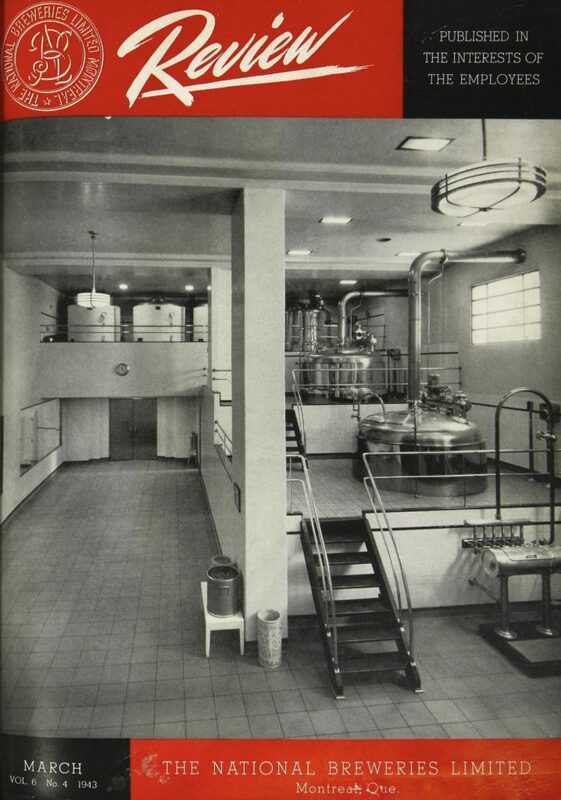 They show a detail and discussion of a pilot brewery installed in the Dawes Brewery unit of National Breweries Ltd. National Breweries later was absorbed into what is now Molson-Coors. All intellectual property in the images belongs solely to their lawful owner, as applicable. Used for educational and historical purposes only, with feedback always welcome. Here is the link to the magazine and, from those pages in general, one may read much interesting history concerning National Breweries Ltd. The issue in question is March, 1943. The magazines were originally issued in French and English but most appear in French only on the site, an online exhibition on the brewery’s history hosted by the City of Montreal. Nonetheless the March, 1943 issue happens to appear in English (this for readers who may look at other issues and wonder about the language. As well, some, but not all, of the narrative material of the exhibition is in both languages; what is not is in French. Another brewery consutant, Canadian-born and trained Bert Grant, was an early microbrewer. He founded Yakima Brewing and Malting in Yakima, WA in 1982. His obituary mentions his acclaimed Grant’s Scottish Ale; I marveled at that ale’s powerful malt flavor when I tried it back then on a visit to family in Portland, OR. That brew was probably better than any modern Scottish ale that I’ve tried. The article also notes his help to other early microbrewers in the northwest. Thanks Arnold, and of course there is Frank Appleton in Vancouver, who recently wrote a memoir. I didn’t mention them, or say Alan Pugsley or Charlie Bamforth, because AFAIK they came somewhat later to the scene. My focus was people doing consulting before 1980 especially to the emerging small brewers. Still, their memories and/or records, i.e., of those who survive, might be quite helpful in the overall context.